This entry was posted on September 15, 2015 by Jessica Anderson. Being in business since 1987, we've seen award fads come and go. But one of the most popular awards we've sold over the years are perpetual plaques. When checking our website search terms, the term ‘perpetual plaque’ continues to be on top year after year. What makes these traditional awards continue to be favorites? I believe it’s 3 reasons – they are attractive, a good value, and ongoing recognition. A traditional Employee of the Month Perpetual Plaque. Quality: The plaque material should be sturdy, free of nicks or blemishes, with an even finish. The back should have a hanger for easy display. Header Plate: The larger header plate should feature attractive engraved text. Examples of engraving include the name of your company, organization or school; your logo or mascot; and the award name. Engraving should be free of scratches with crisp image quality and easy to read text. Ask your trophy provider what process of engraving they use on what substrate. Engraved metal plates are higher quality and higher perceived value than plastic plates. We only engrave on aluminum or brass metal using a rotary-diamond tip engraver or a laser engraver, depending on the design. Engraving Proof Process: Our three engravers Paul, Laurie and Lori design the customer's text so that it’s esthetically pleasing. Then they email a proof of the engraving layout to the customer for their approval before etching. This proof process should be a requirement of the awards company you use to ensure accuracy. Examples of individual perpetual plate engravings on black brass. Individual Plates: Below the header plate are the smaller individual plates with winner's names, which are what make the award “perpetual” (or ongoing). When purchasing a perpetual plaque, be sure that these small plates remove easily for future engraving. Usually they are attached by small screws. When removing the plates, be sure to save these small parts for re-attaching. Also some plaques feature magnetic plates that remove with the push of a finger, making plate removal and engraving simple. Don’t choose a plaque with taped or glued plates, as these will cause damage to the finish of the plaque when removing to engrave. A perpetual plaque can be used for many months or years if planned correctly. That’s what makes this award a good lifetime value. For example, if you offer an Employee of the Month award, you can engrave the winner’s name and month of recognition on the plaque. One plaque with 12 plates can display an entire year’s worth of winners! 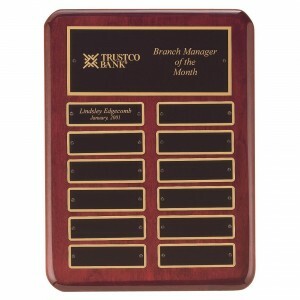 Many perpetual plaques feature plates in multiple of 12s, perfect for monthly or quarterly recognition. When giving an award for an accomplishment, it usually only has a one-time value. The award winner is honored when they receive the award and then the award is forgotten. What is different about a perpetual plaque is that the accomplishment is celebrated on an ongoing basis. If you hang the plaque in a public location for your staff, clients, and vendors to see, they can view this recognition DAILY. The value of the award is magnified when the recognition is continuous. Engraving Names: If you purchase a perpetual plaque, many customers ask how to get names added to the plaque later. It’s quite simple. Just remove the plate and either mail it to us or bring it into our showroom and we will engrave it and return to you. Engraving a name on a perpetual plate does cost an additional fee and is NOT included in the price of the plaque. If you would like to have a name added to your plaque, add the Individual Perpetual Engraving product to your cart. For the individual plate names to match over time, my recommendation is to use the same engraver each time so that the font, size and spacing is consistent. The modern perpetual plaque that homebuilder JayMarc recently chose to honor their employees. 1, Our Piano Finish Economy Perpetual Plaque is a best value. This plaque has a beautiful rosewood finish with a high-gloss piano shine. You would never know this award is under $100! It has a traditional feel, with black brass plates and gold engraving. One of our most popular perpetual plaques, it’s a great choice. 2. I recently worked with JayMarc Homes to create a modern and stylish award that matches their brand. They chose the Black and Silver Perpetual Plaque (pictured) to honor an employee each quarter who demonstrates exceptional customer service. 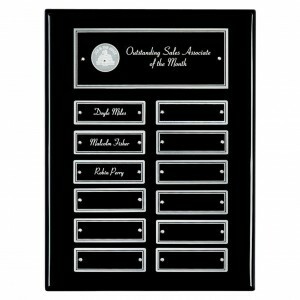 Even though many perpetual awards look rather traditional, this particular plaque with its black color and silver engraving is clean and sleek with a contemporary feel. 3. If you are looking for a plaque with a photo, our Easy Change Plaque is a great choice. You can add a photo of your winner each month and the plates are magnetic, so they can be removed with the push of a finger – no screws! Very easy and convenient to update this plaque. View our entire line of perpetual plaques; they all include the header plate engraving in the price and you work directly with our engravers through our proof process to ensure accurate engraving, as described above. I hope this helps you choose the perfect perpetual plaque for your next Employee of the Month recipient or quarterly award winner. No wonder these awesome awards are some of our most popular!